Located on Yandell Rd off US-51, Extra Space Storage serves residents near Canton, Gluckstadt, Madison, Meltonville, Annandale, and more. Locals will recognize our facility across from Shell east of Gluckstadt Fire Department. 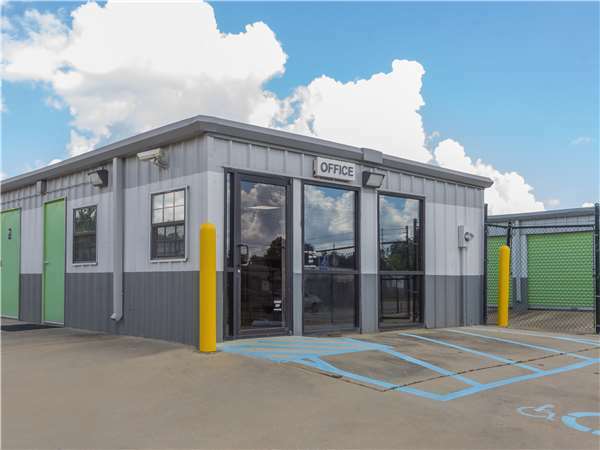 Extra Space Storage on Yandell Rd can accommodate residential and commercial storage needs in Canton with a variety of storage units, climate-controlled storage, vehicle storage, and exceptional security! Our Canton storage facility has unit sizes ranging from 5x5 to 10x40, so we can handle practically any storage need you have. We also have units with features like drive-up access and first-floor access. You can store valuable belongings with confidence at Extra Space Storage! Our Yandell Rd storage facility is equipped with security features like 24-hour video surveillance , electronic gate access, and an on-site resident manager. Worried about Canton's extreme heat and humidity damaging your items in self storage? With climate control, your unit stays comfortably between 55 and 80 degrees at all times. Climate-controlled units come in sizes 5x10 to 10x25. Looking for secure vehicle storage in Canton? Extra Space Storage offers 10x20 to 10x40 enclosed drive-up units and 12x30 outdoor parking spaces to accommodate everything from small motorcycles to large RVs. When you choose Extra Space Storage, you can expect reliable self storage backed by excellent customer service. We work hard to ensure our facility is always clean, secure, and well-maintained, and our friendly, professional staff is more than happy to help with whatever you need. Contact us today to reserve your storage unit in Canton! Excellent location. Easy in and out. Friendly and helpful agents. Good value. I was impressed at the cleanliness of the facility. The staff were also very friendly and answered all of my questions. They went out of their way to let me know about the area as I recently moved here. My family and I see currently storing our belongings at the storage unit on Yandell Road and we are VERY PLEASED AND SATISFIED to say they are the BEST! Along with making you feel comfortable about leaving your belongings their CUSTOMER SERVICE IS EXCELLENT! OLAF WAS AMAZING WE COULD NOT HAVE ASKED FOR A BETTER PERSON TO HELP US! THANKS SO MUCH!!! Would definitely recommend this place. Very clean and Olaf is very professional and helpful. ExtraSpace Storage is the best storage in the Gluckstsdt area. Clean units and friendly staff. Easy process to rent a stall. Location is clean and has good security. Excellent & personal customer service made this an easy process! Office, grounds & unit super clean & safe! Cannot say enough of the knowledge & help of Trevor on size & type unit needed ?? Terri, the customer service representative at the Canton, MS facility, needs to be cloned! She has a great demeanor and outgoing personality. She answered my questions and explained my contract in detail. Drive southwest on Hwy 51. Turn left onto Yandell Rd. Our facility is on your left, just before Aulenbrock Dr.
Drive northeast on Hwy 51. Turn right onto Yandell Rd. Our facility is on your left, just before Aulenbrock Rd. Drive west on Yandell Rd. Pass Madison Crossing Elementary School. Our facility is on your right, just beyond Aulenbrock Dr.
Drive east on Gluckstadt Rd. Pass Levi Strauss & Co. Turn right onto Weisenberger Rd. Turn left to stay on Weisenberger Rd. Cross Hwy 51 and continue straight onto Yandell Rd. Our facility is on your left, just before Aulenbrock Dr.